Cielo and her husband transformed their backyard from a hillside of weeds and iceplants to what it is today. Their backyard is an outdoor living space, and they spend most of weekend daylight hours in our backyard. Taking the inside outside means making outside as comfortable to rest in between or after working in the garden. Their backyard is a terraced hillside garden with over 200 fruiting plants (deciduous, subtropical and tropical fruit trees), and a kitchen garden. The majority of the tropical fruit tree collections is mango - 30 varities. 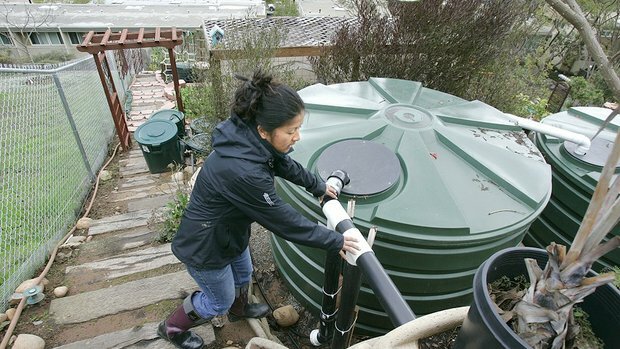 To help sustain the fruit trees, 2 1100 gallon rain harvesting tanks were installed in 2009.